These slow-moving rodents protect themselves from predators with an unusual defense: 30,000 long, sharp quills—actually modified hairs over a sheet of muscle—that can be lodged in and even kill an attacker. In summer, porcupines eat leaves, nuts and berries. During other seasons, they favor the bark, buds and needles of trees. 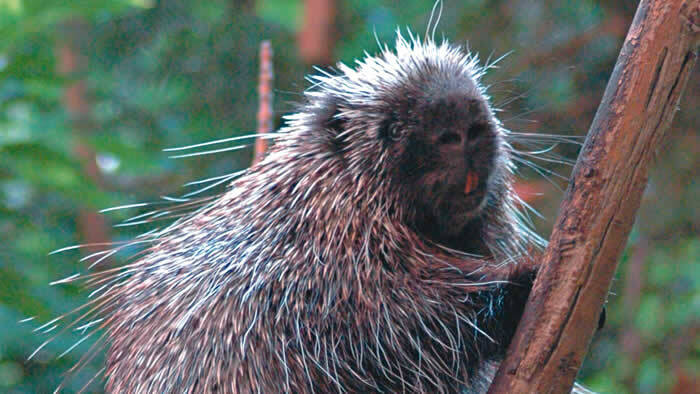 Porcupines are found in all of Minnesota’s forests and even in wooded farming areas. There may be several porcupines in a square mile of forest. Porcupines have such an effective defense that they don’t need to move quickly. They tend to stay close to home, which is often high in a tree. Porcupines are doing well in Minnesota. Head & body: 23-29 in. Height: (at shoulder) up to 12 in. A young porcupine is armed and dangerous within minutes after birth. Its quills harden quickly and the youngster is soon capable of lashing out with its painful little tail. Porcupines cannot throw their quills. But they can release these hardened, barbed hairs once they’ve stuck them into an attacker’s skin. American Indians may use the porcupine as a source of food and adornment. The hollow quills are woven into baskets and headdresses, and cut sections are used like beads to decorate birch bark boxes, moccasins, and clothing. Quills are equipped with barbed tips, and can only move in one direction (forward) once embedded. 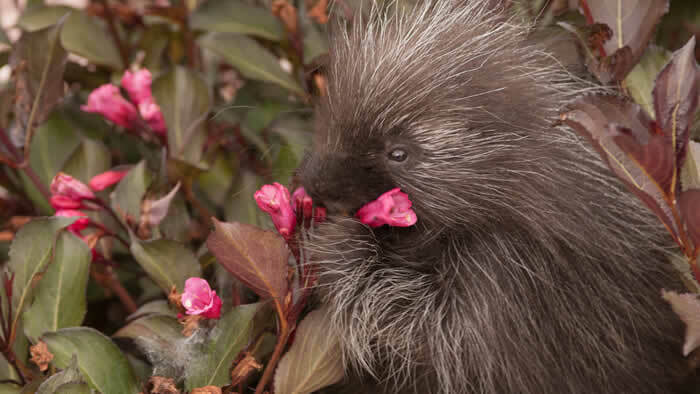 Besides a means of defense, quills help porcupines in another way. Each is filled with a spongy, pith-like substance that provides buoyancy for porcupines when they swim. 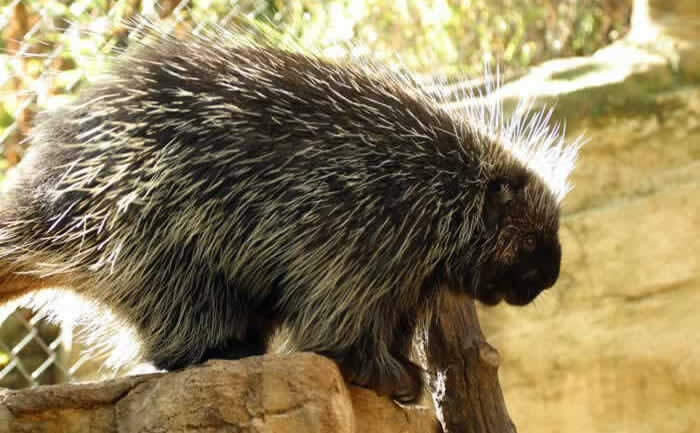 Porcupines often get stuck by their own quills, when falling out of trees. Most of the time they are able to remove these quills with their teeth and front paws. An antibiotic is present in the quill, which prevents infections from occurring.